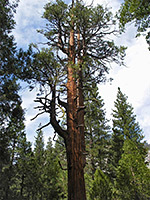 Probably the most popular trail in Kings Canyon is the 1.5 mile, mostly level loop around Zumwalt Meadows, a large clearing in the forest filled with wildflowers, ferns and tall grass, with the gently flowing Kings River on one side, the vertical granite cliffs of Grand Sentinel on the other, and taller peaks (Glacier Monument and Buck Peak) rising in the distance to the east. Besides the imposing scenery, the path also reaches several quiet places along the river, good for paddling or picnicking, though without stopping the loop can be completed in a leisurely 40 minutes. There are many good photo opportunities along the trail, and the landscape is quite colorful, the yellowish grass making a nice contrast to the white-grey cliffs and the deep green of the adjoining pine trees. 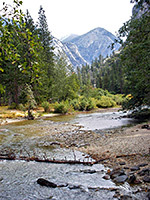 Panorama of Zumwalt Meadows and the Kings River. As many people visit the meadows, the trail is provided with quite a large parking area, one mile before Highway 180 terminates at Roads End, and 4.5 miles from Cedar Grove. The NPS sell a guide and map ($1.50) that describes various numbered points of interest along the path, which starts by heading southwest along the riverbank, through a patch of woodland, over a field then across the river on a suspension bridge. Turning back east, the route is through thicker forest for a short distance to a junction, just before the edge of the open area. The loop can be hiked in either direction though most take the left branch as this gives the first and best view of the meadow. 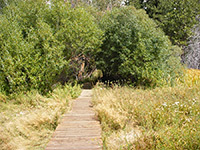 The grassland itself is off-limits to hiking in order to protect the plants but it can be seen from many places along the path; this crosses the edge of the clearing on a wooden boardwalk (see panorama) and winds through a thin band of trees between the river and the meadow before reaching another junction, with the River Trail to Roads End (0.6 miles) and Bubbs Creek (2.8 miles). The right fork is the return route along the south side of the meadow, a slightly more exposed path that rises about 60 feet to cross an area of large granite boulders at the foot of Grand Sentinel. A patch of broken trees along the way suggests that rock falls are quite common hereabouts.